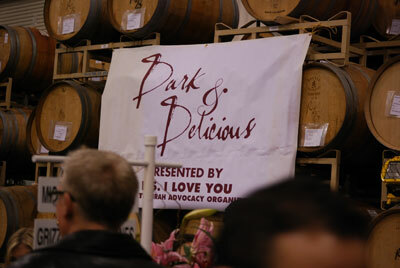 Last Saturday's Pinot Summit put on by the wonderful Barbara Drady at Affairs of the Vine was a wine filled delight. Starting around 1:30, we reported to the FiDi Hilton and were swept away by an assortment of Pinot. Pinot Noir can be difficult, but when done well, is amazing. And done well can mean so many different styles from restrained, chiseled Burgundian to florid, nearly Zinlike. There is a Pinot for everyone. Tasting blind throws a cool angle in as well. With no label, place or producer visible, it really is about one's perception of the glass in front of you. I always find something new to love. This year, there was a lot to love. '09 Lazy Creek Vineyards, Estate Pinot Noir, Anderson Valley, California, USA. ($42) This wine was a bright garnet with aromas of cherry and a drop of vanilla. It had a nice acidity and a sensation of balanced deliciousness. I physically had trouble spitting it out because it was so tasty. They are in the process of updating the tasting room, which is in Philo. It sounds like a place I would definitely like to visit to try the other varieties of wine that they produce. If the Pinot is any indication, there are treats out there to find. 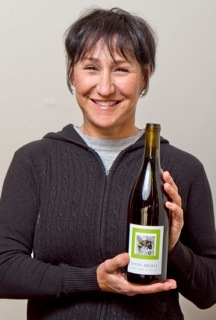 Deb Mayo, our Pinot Hero! 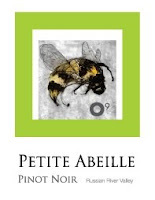 '09 Petite Abeille, Petite Abeille Vineyard Pinot Noir, Russian River Valley, California USA ($35). This wine had a seductive color, clear garnet with coppery hints. It has that delicious, RRV Pinot perfumey cherry with spiced vanilla. 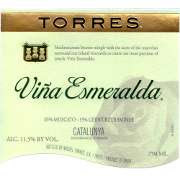 Flavors to match with a nice acidity and a lovely cherry kissed lingering finish. We got to chat a little with Deb Mayo who grows the grapes and makes the wine. She uses four clones to grow the fruit that shapes her final product; Calera, Pommard, Swan 828 I found her fun and informative and will certainly be on the lookout for this wonderful wine. More later on some additional favortites as well as a breakdown of the top vote getters in the other categories. What do you serve with good friends, great fashion and a fun annual event? Don Sebastiani and Sons The Crusher Rose of Pinot of course. This is a wine with beauty and taste enough to to walk any red carpet. As soon as I poured it, there were Oohs and Ahhs for the lovely rose petal pink color. Then when they got their glasses, more exclamations of delight for the yummy aromas. Stone fruit. Jolly Rancher Cherry Stick,. Watermelon juice. And a river fresh mineral splash. Of course when the sipping started, the yummy noises stopped because we were too intent on enjoying the lovely fresh balance of the wine. With peaches, thyme,and red fruit and a lovely acidity, along with a nice lemon twist finish, it was a great match for all the bites being passes around. But I had received this on Valentine's Day with a box of chocolates too delicious for this world from Le Belge. So I put it to the test with my Movie Candy cupcakes. Yum! The wine stood up to the sweetness as beautifully as it did the savory. So whoever takes home the Oscar, we have a winner in the house. At only $18 I know what I will be sipping on my parch this Spring! It's nice to have good friends. With all the BrixChicks otherwise unavailable, I called upon one of my good friends to take up the burden of the extra ticket I found myself with for last week's "Dark and Delicious" event. Ha! BrixChick stand in Marina jumped at the chance to swill study a variety. I thought it would be fun to survey two of my favorites and compare and contrast in advance, so she would have a background to better enjoy this distinctive grape. So we nabbed some Mexican food we thought would make an interesting pairing and set to work. '08 Stags Leap, Petite Sirah, Napa, California, USA: This is one of my go-to restaurant wines. It came out inky dark and ready to drink. Smooth flavors of black fruit with hints of spice, pepper, berry and a touch of dark chocolate. We found the wine immediately accessible all on its own, and it also tasted good with the meaty spiciness of our food. Our new friend Jonesing for Wine had a bottle he hated that was an '07. I found it interesting that he described it as vegetal, a quality to which I know my palate is very forgiving. Still, I did not find notes I would describe as vegetal either in this sitting or in the Dark and Delicious offerings, so maybe Jonesy got a bad bottle. Lucky us! We liked this very much. We hope he will try again with a different vintage. 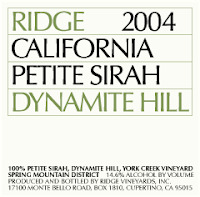 '04 Ridge, Dynamite Hill, Petite Sirah, Spring Moutain, Napa, California USA: I have some more of this and I will certainly decant for at least an hour before I serve it. As expected this had a dark purple color. It had restrained aromas of dark fruit with a whisper of menthol and a smidge of butterscotch. The initial flavors were black fruit with dark chocolate in the mid palate. Initially, I thought it was food slutty as it tasted okay (and by okay I mean inscrutable more than tasty) right out of the bottle on its own, but when paired with the steak tacos, YUM! In combination with the food, the spice, black fruit and chocolate came up and it was markedly more tasty with food. After about an hour, it had opened up and was tastier as well as complex. Sort of like reading a Russian novel after you read the Cliff Notes. Throughout the wine displayed subtle, pretty tannins. It had been made with fruit that had been destemmed without crushing so that the seeds stayed gently encased in the pulp and skin as well as handled gently to tame the tannins. It's hard to find, but worth getting. J. Baldwin Wines Bold and lush, this Petite Sirah was dark and flavorful. J Baldwin is a small family winery tucked up high in Sonoma county. 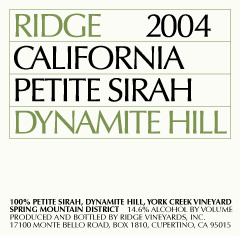 You can almost taste the Sonoma sun and the mountain fog in the carefully made wine. Berryessa Gap: Yummy examples of Petite Sirah as well as one they label "Durif", Whatever you call it, it was all delicious. Don Sebastiani and Sons, "The Crusher" : I walked my feet off looking for this. Since I was familiar with the delicious Rose of Pinot, I did not want to leave without trying the Petite Sirah. I finally found it and was rewarded with a tasty offering made rounder with a little Merlot that added juicy succulence. I will be looking for this PS as well. As for the food, there were too many delicious bites to list. My stand out was the Bacon Salted Caramels that Nosh This put out. Salty, bacony, chocolaty and silky sweet. It brought out both the meaty and sweet elements that go well with Petite Sirah. No, you didn't need to know this was in the world either, but if you get a chance to try one (or four) make sure you do. Super yum! Many many thanks to Jo Diaz for her tireless efforts to put passion in a glass. PS I love you, too! Start with Crab stock to enhance the overall “crabbiness” of the dish. Over a 6 to 8 quart stockpot, twist the legs off the crab. Break the small legs off into the pot. Remove the knuckles and trim the legs and claws. Crack the trimmed crab pieces to make them easier to eat when served. Add the small bits that fall off during the cracking to the pot. Remove the center section of the crab and scrape yellow-green tomalley into the pot. The graying fleshy bits are the lungs. Discard those and do not use. Also remove and discard the head sac, the section behind the face/eyes. Chop the carapace and toss into pot. Once the lungs are removed, break the body into four sections to serve in the paella. Add the trimmings from those to the pots. Repeat with other crab. Cover with the 2 quarts water. Bring to a boil. As it boils, white foam will bubble up. Use a ladle to remove the foam. Pushed from the center to the sides will make it easier. Reduce the heat so the stock cooks at a fast, steady simmer. Add the onion, tomato, garlic, bay leaves, peppercorns and thyme. Let the stock cook down for about an hour. The liquid should just cover the crab shells. Add water if necessary. Add salt to taste. At this point it should have a golden color and a rich taste. If a richer taste is desired, cook down 20 min more. Strain through a fine mesh strainer. Refrigerate overnight. Or put on the back burner while you prepare the rest of the paella. I adapted a recipe from Whole Foods. Add, clam juice, saffron, bay leaf and thyme to 8 cups of stock. Simmer for 10 minutes. Season with salt and pepper. Keep hot on the back burner. 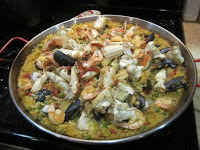 In a shallow paella pan or ovenproof sauté pan (about 18 inch diameter) heat ½ cup of the olive oil. Sauté the squid. Remove when done and set aside. Add the remaining tbsps of oil and sauté the onion and garlic over medium heat until softened. Add the tomato sauce and red peppers and cook for 2-3 minutes more, stirring well. Add the rice to the pan, stirring well to completely coat the rice with the onion mixture. Return the squid to the pan. Add the peas. Stir well. Pour in 7 cups of the hot broth (reserve one cup) and cook uncovered at a very low simmer for 15 minutes or until the rice begins to absorb most of the liquid. Stir once to make sure nothing is sticking to the bottom. Arrange the shrimp, mussels and clams on top of the paella, pushing them into the rice and broth. Place in the oven and bake for 20-25 minutes or until liquid is absorbed, rice is just cooked, the shrimp are pink and mussels and clams have opened. Check after fifteen minutes and if the rice seems very dry, add the remaining cup of broth. If it looks okay texture wise, just add the trimmed crab legs, claws and bodies and return to oven. Remove from the oven, cover with foil and let rest 5 minutes before serving. Serve with lemon wedges and lots of wine! If you are reading this before 2./29/2012 it's not too late to enter yourself! NV Gruet Blanc de Noirs: fresh apple smells, “very light, disappears in your mouth,” “flash of green apple,” “Yum! I like it!” “Plus!” This wine was a favorite of the evening for several of the tasters and it paired extremely well with all the food. 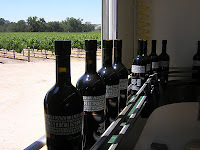 And it was just plain fun for Brix Chick Heidi to finally try this wine from New Mexico. 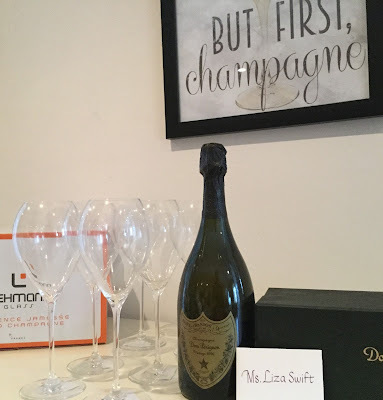 NV Mumm Napa “Cuvee M”: smells of cream, strawberries, and bread/ toast, nice acid, screams out “Asian food,” smooth, crème brulee notes, fizzy, “plus.” This wine was also among the favorites for several tasters and shared by Brix Chick Liza who blogged about it earlier today. NV Dibon Cava Rosado: smells like a party and looks like a pink party dress; “skittle-aged,” fresh strawberry cream, currant and almond on the finish, fizzy, ""check or check-plus.” The group was divided on this one. NV Piper Hiedsieck Champagne Brut: unripe kiwi notes, “Yummy!” clean, classic flavor with flinty hints of green fruit; clean and crisp; great with quiche Lorraine and reminiscent of a late lunch in a French bistro a long time ago. “Plus, plus!” This wine was among the favorites for the evening. 2008 Taltarni “Taché” (Pinot Noir-Chardonnay-Pinot Meunier): A clear favorite of the tasters; “Plus, plus!” strawberries and cream; herby and sage-like notes, peach. Brix Chick Heidi was happy to try this sparkler from New South Wales. NV Chandon “DKNY 20 Year Cuvee”: perfumy nose, cantelope, toasted mallow, a birthday treat. NV Schloss Biebrich Sekt: smells like a perm but tastes different; mineral splash and like raspberry or peach BonneBell Lip Smacker, sweet; perfume in your mouth; good with dark chocolate cake. NV Zonin Prosecco: fresh with some almonds or hazelnuts and pairs surprisingly well with the dark chocolate cake; dry. And last, and probably most colorfully commented on: Peach Amour de Paris: old-school Bath & Body Works; peachy keen jelly bean; peach Schnapps; sophomore year of college; body splash; potpourri." After this pot luck, Brix Chick Heidi will be on the look out for more Gruet and Taltarni-- and might just pour a glass of Piper Heidsieck the next time she has quiche. The wine itself has a lovely color--pale gold warmed by peach. With a touch of creaminess in the mouth feel, it's the kind of offering that will work for sophisticated guests as well as novices whether you are celebrating something special or just Thursday night. I got flavors of strawberry, stone fruit and a hint of toast. I was given the wine as a sample but have bought across the Mumm's pyramid since I visited. Pyramid tasting is trying the wines across a winery's offerings starting with value and moving up to the flagship wines. In the case of Mumm Napa, the nicest thing was that I found something I loved in all the bands of their pyramid. While I thrilled at the DVX, all the price bands contained delicious, special sparklers. One reason is the laser focus on quality exhibited by the team at Mumms. We tried the base wines of both bracingly acidic Chardonnay and rough edged Pinot Noir. It is amazing to me that the winemakers can taste and gauge and mix to produce such yummy sparkling wines from these beginnings (although I will admit I polished off my Pinot!). It reinforced the magic of winemaking to me. Our tour leader introduced me to concept called "fractioning" where the team makes base wines from all the vineyards and both varieties to come up with still wine that gets blended into the Mumm's offerings across the pyramid. The Cuvee M pulls from over 50 vineyards and both Pinot Noir and Chardonnay, to come up with the flavors and textures. The best thing to do is try it! Fair warning, you will want to try all the offerings - I was also entranced with the Reserve Brut Rose and the Carlos Santana sparkler too. February 15th, 2012 is Wine Blogging Wednesday, a monthly event with a special theme in which wine bloggers write about a wine that matches the theme. 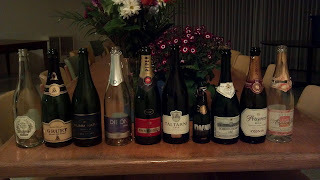 This month is a theme that I LOVE: Sparkling wines $25 and under. What makes a pricey champagne (vintage or non-vintage) from Champagne so great to me are the yeasty, toasty notes they acquire from so much ageing on the "lees", which are deposits of yeast in fermentation tanks. Will a $15 bottle of Brut from the Languedoc have the same yeasty complexity? NO, but it has been aged on lees for 18 months so it has some of that flavor and texture that I love so much. This sparkler has a good balance of fruit and yeastiness. It is composed of 50% Pinot Noir and 50% Chardonnay. It tastes like strawberry jam spread on toasted brioche with slices of tart green apple. It is crisp and dry and has a long, creamy finish making me want to drink more. It pairs especially well with sushi. This sparkling wine is special and is only carried by K&L Wines, a large wine store in the Bay Area. They import it directly from the producer, Jean -Louis Denois, one of the oldest wineries in the Languedoc region of Southern France and the grapes for this sparkler come from vineyard sites in the French Pyrenees. If you are not in Northern California just click on the link above and order some of this sparkling wine. You cannot beat the quality of this wine at the price of $14.99. Ample parking, expertly paired treats and a chance to survey many different expressions of this engaging grape variety await us. Petite Sirah has an inky, brooding character. It will stain your teeth purple. And you will love it! You simply cannot beat this opportunity to learn more in the best way possible---by experience. 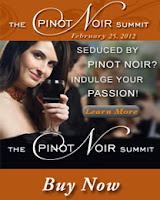 58 Winemakers and 36 purveyors of tempting taste treats will be on hand to show you just how engaging this wine can be. Names you know and love already like Ridge, Stags Leap and more will be on hand with some that may become your new favorites. As for the snacks, one word: Paella! And tons of other sweet/salty/savory yumminess. Petit Sirah is a cross between the Syrah grape and what little known French variety?